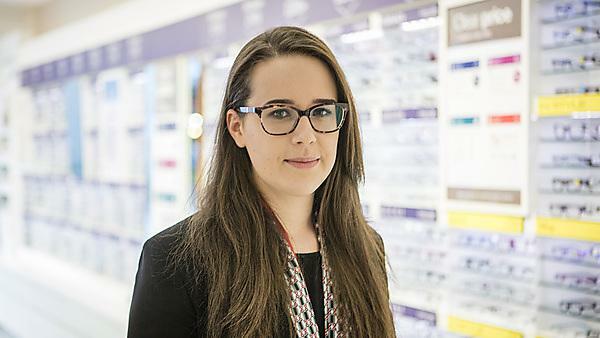 After graduating, Chantelle Ford started her pre-registration year at Vision Express and is on her way to becoming a fully qualified Optometrist. Since finishing my degree I’ve started my pre-registration year at Vision Express in Plymouth and have about one year until I will be a fully qualified Optometrist. Transitioning into my pre-registration year was made so much easier by the help from University of Plymouth, as we were able to secure our first jobs (pre-registration year) in the second year of our degrees. It’s been less than a year since I’ve properly started my career towards becoming a fully qualified Optometrist, so I’m not sure I can answer this question! But I love meeting new people on a daily basis! Take every opportunity that’s offered to you: take the plunge and get out of your comfort zone. If you’re going to ‘put yourself out there,’ university is the place to do it! Don’t worry so much, because the hard work pays off. People skills are vital: if you can communicate well with patients and gain their trust it will make your job so much easier, because they will be more open to your help and advice. Don’t worry about securing your pre-registration as you’ll get an offer from at least one of the multiple opticians. University has helped me to become so much more independent and to experience so many different things. I’m so much more confident than I was at the age of 18 when I was first turning up to my new halls, and the university experience has been the main reason for this. The support from all of my course tutors and the wider support from the University as a whole has made the last few years that little bit easier. I’ve learned all of the vital skills to become a successful Optometrist. My last year at the University of Plymouth Centre for Eyecare Excellence gave me the confidence I needed, with regards to practical skills, to give me an easier transition into my pre-registration year at Vision Express. One lesson I’ve learned is not to leave things until the last minute! The placement weeks during the course give you a real insight into how optician stores work and how every member of the store works together in their roles. It also gives you the chance to ask qualified Optometrists who work in practice questions, and to see which type of practice you would like to do your pre-registration year in. I don’t think I could pick one memory: I had such a good three years. Meeting so many new people and making best friends has been brilliant, and we’ve all had such a good time enjoying all of the events over the past three years. The end of year Optometry ‘EyeBall’s’ were always a laugh, and it was good to talk to the lecturers and tutors outside of the teaching environment. I’m in touch will lots of fellow alumni and we try our best to meet up, even though we’re spread across the UK. I’m in touch with clinic staff and tutors at the CEE clinic and aim to stay in touch with a few of the academics at PAHC. Yes, it has been the best three years of my life. There are so many opportunities for joining different societies and for taking part in various events and fundraising, it helps to create such a good community between students at University of Plymouth. Of course, the quality of the courses is important, but student life can make or break your experience at university.